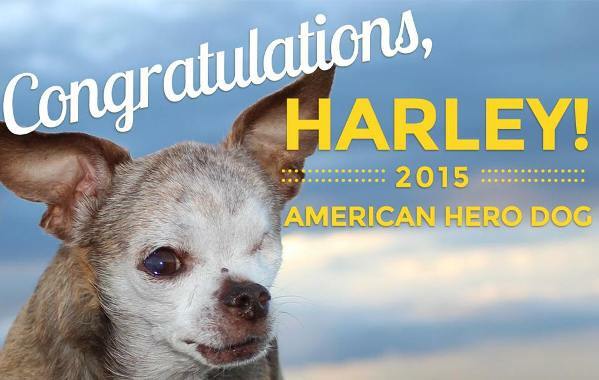 Congratulations to puppy-mill survivor Harley, who was announced last night as the American Humane Association 2015 American Hero Dog. The 15-year-old Chihuahua spent 10 miserable years of his life living in a cage. During that time the little dog suffered heart disease, a fused spine, broken tail, gnarled toes, deformed legs and rotted teeth. He lost an eye when his cage was power-washed while he was still in it (believe it or not, this is a common practice in puppy mills). Harley was finally rescued and is spending the rest of his days with his loving forever family in Berthoud, Colo. He was the inspiration for the “Harley to the Rescue” campaign, which for the past two years has raised funds to rescue and provide medical care for more other puppy-mill dogs. Harley goes along on the rescue missions to comfort the sad, scared dogs. He also makes appearances across the country as a spokesdog against puppy mills. Harley was the finalist in the Hero Dog Awards’ Emerging Hero Dogs category, for “ordinary” dogs who do extraordinary things. The purpose of this annual national competition is to recognize dogs who unconditionally help humans. The winners in eight categories were selected from more than 1 million online votes and a judging panel. “These courageous canines have gone above and beyond the call of duty, saving lives on the battlefield, comforting the ill, aged and afflicted, bringing hope to those who have lost it and reminding us of the powerful, age-old bond between animals and people,” said Dr. Robin Ganzert, AHA president and CEO, in a press release. Along with the Hero Dog Award finalists, the celebrities attending last night’s sold-out gala event at the Beverly Hilton included Fred Willard, Lea Thompson, Michelle Beadle and Bruce Boxleitner. 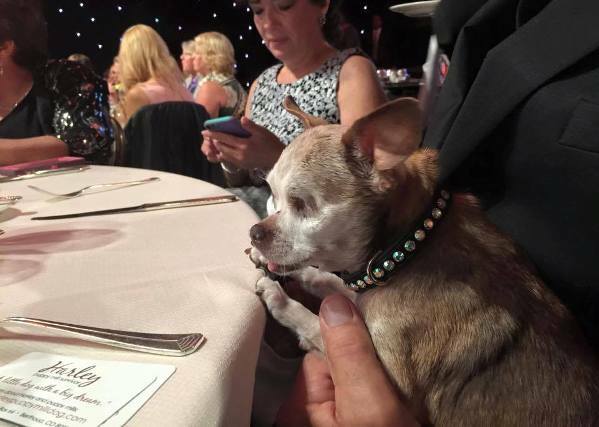 Mark your calendar: The American Humane Association 2015 Hero Dog Awards will air on the Hallmark Channel Oct. 30 at 8 p.m.